The Mask of Zorro builds on a long swashbuckling tradition. Most of us are most familiar with the Zorro of the 1950s, the television show from Walt Disney studios. But Zorro has been around much longer than that. He was created in the 1920s in pulp novels and was the subject of a number of movies from the 1920s through the 1940s. 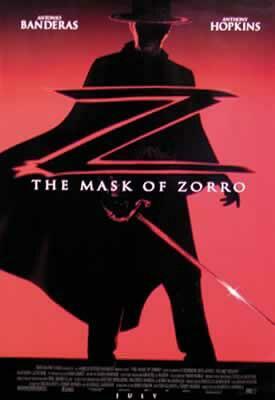 1998's The Mask of Zorro brings the legend to a new generation. Two Zorros for One Ticket! The Mask of Zorro treats us to not one, but two Zorros. An embarrassment of riches becomes wealth untold when I further inform you that the two Zorros are played by Anthony Hopkins and Antonio Banderas. 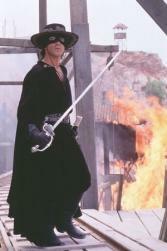 Hopkins plays Don Diego De La Vega, the original Zorro. The film opens in old Spanish California with a daring Zorro rescue followed by tragedy. De la Vega is identified as Zorro by Don Rafael Montero (Stuart Wilson), who arrives at the de la Vega hacienda to arrest him. Montero has a personal reason to hate de la Vega; he is in love with de la Vega's wife Esperanza (Julieta Rosen). In the chaos of the arrest, Esperanza is accidentally killed. De la Vega is thrown into prison, and Montero takes the baby Elena (Maria and Monica Fernandez Cruz) to raise as his own. The story now jumps forward to twenty years later, when a number of events are happening. We are introduced to rather inept young bandit Alejandro Murrieta (Antonio Banderas), whose brother and partner in crime Joaquin (Victor Rivers) is killed by US Army Captain Love (Matt Letscher). Alejandro is now a man with a vendetta. Don Rafael Montero returns to Spanish California with baby Elena (Catherine Zeta-Jones), all grown up and believing Montero to be her father. And de la Vega breaks out of prison. De la Vega still has the craft and guile of his namesake fox, but he is now an old man. Still, he is determined to get his revenge on Montero. He meets Alejandro, drunk and ranting about revenge, and sees a way to help them both - Alejandro will be the new Zorro. It's going to take a lot of training to turn loutish young Alejandro into the deft and elegant Zorro, but de la Vega easily assumes the role of elder mentor. Montero and Captain Love turn out to be co-conspirators, so the two Zorros have a common goal. Montero's plot involves buying California from Mexico and establishing an independent state. To buy the territory, he intends to use gold from a secret gold mine that Mexico is unaware of. Essentially, he intends to buy California from Mexico using Mexico's own gold. And being the baddie that he is, the mine is being worked by peasant slave labor. A further complication is Elena. De la Vega realises that Montero's "daughter" is actually his own baby Elena, that she was raised by Montero and loves him. He must somehow get his revenge and rescue Elena without traumatizing the young woman who loves the monster. And as for Alejandro, he's fallen in love with Elena. Everything that ought to be in a Zorro movie is here. Sword fights, swinging through the air, explosions, leaping onto the back of the trusty black steed. Striking the heroic pose while the horse heroically rears - it's all there. The Mask of Zorro was directed by Martin Campbell. The screenplay was written by John Eskow and Ted Elliot & Terry Rossio, from a story by Ted Elliot & Terry Rossio and Randall Johnson, and based on the character created by Johnston McCulley.